Exclusive Interview with Police Abuse Victim and Occupy Activist Cecily McMillan - This Can't Be Happening! In an exclusive intervew on the Progressive Radio Network’s “This Can’t Be Happening!” program, Occupy Wall Street activist Cecily McMillan, just released after two months of a three-month sentence to the Women’s Prison on Riker’s Island, talks about her conviction on a trumped-up charge of felony assault of a New York Police Officer. A master’s degree student at New York’s New School, McMillan explains how the arresting officer she was convicted of felony assault for elbowing in the eye had actually grabbed her breast from behind, causing significant bruising, and then threw her to the ground, where she was further injured. 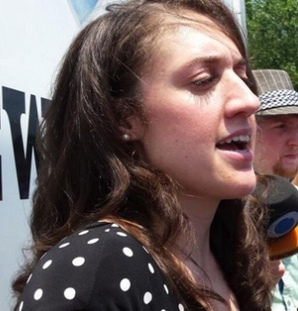 Occupy Wall Street activist Cecily McMillan after being released from Rikers' Island jail. Her puny three-month sentence and her early release after 2 months are proof that the charge of felony assault of a NYPD cop was trumped up DA Cyrus Vance Jr.
McMillan, who refused on principle a plea bargain offered by Manhattan DA Cyrus Vance, Jr. that would have left her with a felony conviction but perhaps no jail time, insisted on a full trial. She tells host Dave Lindorff how she was then barred by a pro-prosecution judge from presenting evidence to the jury about the arresting cop’s history of brutality and corruption.